Jack Nicklaus celebrates the hole in one with his grandson Gary. 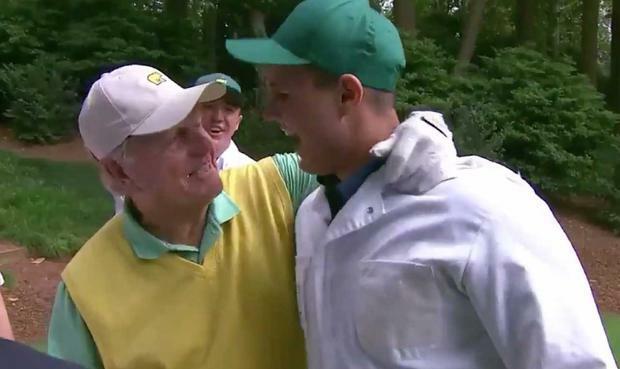 Jack Nicklaus’ grandson Gary produced a magical moment in the pre-Masters par three tournament as he sank a hole-in-one amid joyous scenes at Augusta. Former Masters champion Tom Watson won the traditional event that opens up Masters week and he was in a group alongside fellow golf legends Nicklaus and Gary Player when Nicklaus Jnr enjoyed a magical moment that produced raucous cheers from the huge crowds looking on. Planting his approach in the centre of the green, the ball rolled perfectly down the slope before finding its way into the hole, with Granddad Jack leading the celebrations.